The Grumpy Economist: Inevitable slow recoveries? Many economists say the agonizing recovery from the Great Recession...is the predictable consequence of a housing market collapse and a grave financial crisis. ... any recovery was destined to be a slog. This argument has been batted back and forth, but a new angle occurred to me: If it was so obvious that this recovery would be slow, then the Administration's forecasts should have reflected it. Were they saying at the time, "normally, the economy bounces back quickly after deep recessions, but it's destined to be slow this time, because recoveries from housing "bubbles" and financial crises are always slow?" No, as it turns out. I went back to the historical Administration Budget proposals and found the "Economic Assumptions" in each year's "Analytical Perspectives." This gives the Administration's forecast at the time. 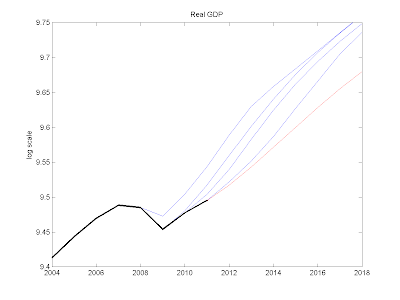 Here is actual real GDP (black line) together with the Administration's forceasts (blue lines). The red line is the current blue chip consensus (also as reported in the budget), which I'll get to in a minute. As you can see, there is nothing like an inevitable, forecastable, natural, slow recovery from a financial crisis or "housing bubble" in the administration's forecasts. Their forecasts at the time look just like my quick bounce-back-to-the trend line that you see in my previous posts, and John Taylor's, and lots of others'. And they are surprised each year that the fast recovery doesn't happen. Here you see that each year the Administration was forecasting that within a year the economy would experience a sustained period of strong, 4% or more, "catchup growth" until it gets back to trend. And each year they have been disappointed. So, if a slow recovery is the inevitable result of a financial crisis, why was the Administration forecasting the "normal" fast recovery all along? The natural conclusion is that the administration thought, as I thought, that the economy should have grown quickly, as it typically has in the past. The "slow growth after financial crises" isn't a fact in the first place. And to the extent that it is a fact (it's a "fact" over a sample of countries not very representative of the US now), slow growth is not the inevitable result of a financial crisis itself, but a result of the mismanaged policy that typically follows a financial crisis, such as bailouts, close-the-barn-door-after-the-horse leaves banking regulation, trampling of property rights that scare creditors away, high taxes and so forth. After all, there isn't any economic theory of this "natural" slowness. The Administration expected strong growth, financial crisis or no financial crisis. In fact they're a bit defensive that they expect stronger growth than the blue chips. Some international economic organizations have argued that a financial recession permanently scars an economy, and this view is also shared by some American forecasters. 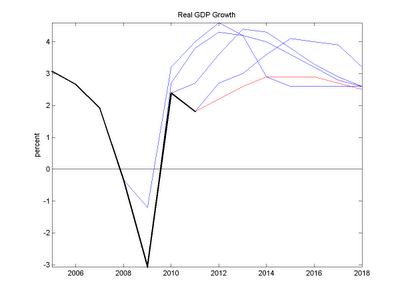 On that view, there is no reason to expect a full recovery to the previous trend of real GDP. The statistical evidence for permanent scarring comes mostly from the experiences of developing countries and its relevance to the current situation in the United States is debatable. 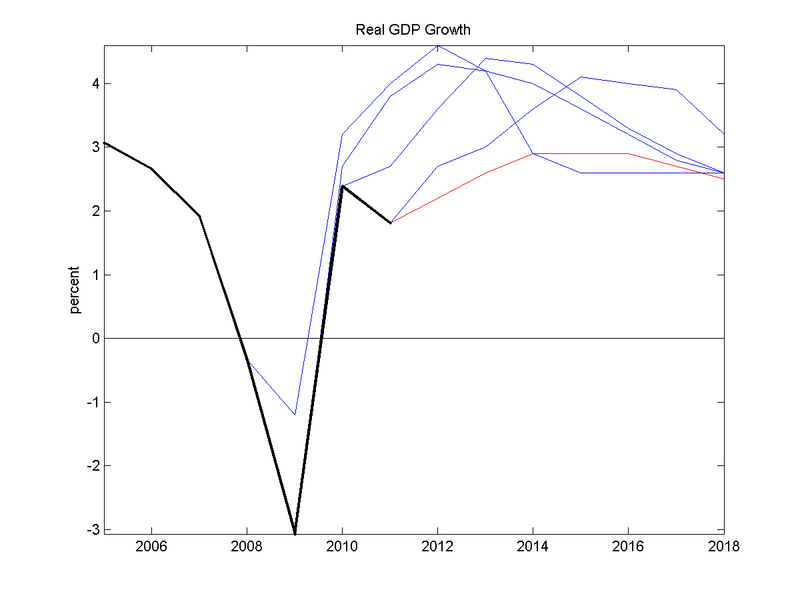 Historically, economic growth in the United States economy has shown considerable stability over time as displayed in Chart 2-7. 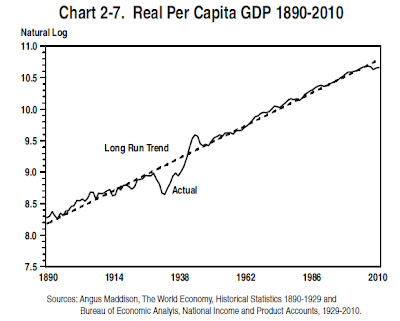 Since the late 19th century, following every recession, the economy has returned to the long-term trend in per capita real GDP. This was true even following the only previous recession in which the United States experienced a disastrous financial crisis – 1929-1933 – although the recovery from the Great Depression was not complete until World War II restored demand. The U.S. economy has enormous room for growth, although there are factors that could continue to limit that growth in the years ahead. Ok, except for that silly bit about how great WWII was, (almost echoing Paul Krugman's idea that the key to prosperity is for the government to fake an alien invasion) we seem agreed. So, the natural conclusion is, what are these "factors" that "continue to limit growth?" If the patient should naturally recover quickly on his own, as every time in the past, perhaps, just perhaps, too much doctoring is to blame? 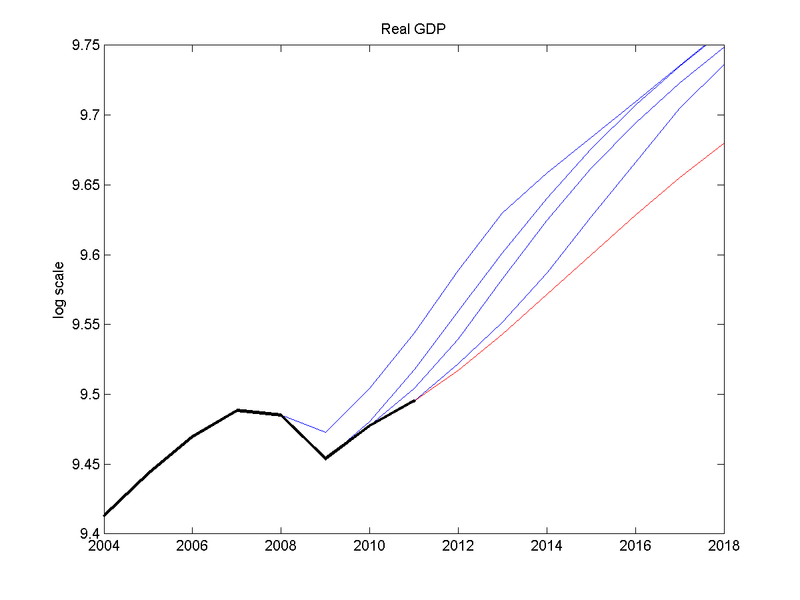 Now, the red line, the blue chip consensus forecast. 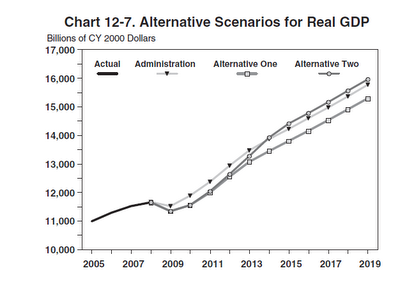 The administration's forecast is quite a bit above the blue chips. As it was throughout. A natural interpretation is that this is the usual "rosy scenario" used to make budgets look better. Possible, but I prefer the interpretation that these are honest forecasts, reflecting the natural and correct idea that the economy should spring back quickly from deep recessions, no matter whether associated with more or less financial turmoil. Really, it make no sense that they knew they were in for 3 years of horrible growth and joblessnes, but just kept putting out ridiculously optimistic forecasts, which they knew would be wrong. 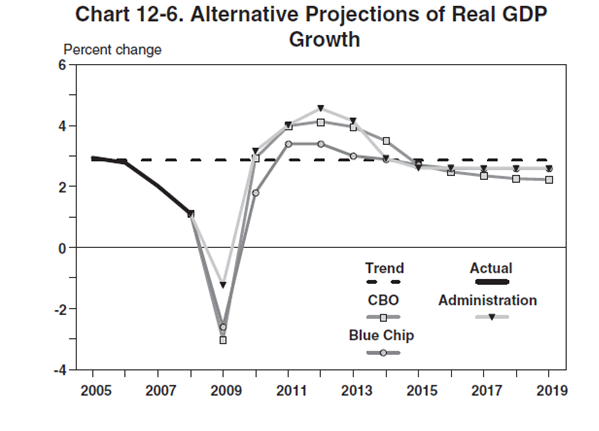 The blue chips could simply be reflecting a more cynical (or in my view, realistic) effect of how bad the Administration's policies would be for growth and recovery. They are supposed to be forecasts of how the economy will behave given policy, not it's "natural tendencies." This argument has been batted back and forth, but a new angle occurred to me: If it was so obvious that this recovery would be slow, then the Administration's forecasts should have reflected it. John, right facts, wrong conclusion. In case you had not noticed, a great number of us very moderate, very middle of the road Keynesian Democrats are a mad as hell at Obama and Team Obama(Summers and Romer, especially) over how badly he has lead and communicated. Simply put, Obama badly dropped the ball in at least two ways. First, he did not lead about how truly damaged the economy was and what was needed to repair the damage. Instead Romer just lied when she said not more than 8%. Second, he wasted all his time and energy on health care when he should have been using his filibuster proof majorities to do the things that needed to be done to fix 30 years of horrible economic and tax policy. In sum, there is nothing much about his record that is defensible in any way and you will not find most voters for him defending him. Obama's saving salvation is that Team Republican is worse. The Republican party of 30 years ago could have fielded 20 candidates better than Obama. Today, it doesn't have a single candidate because it has become dominated by wacko right wing wack jobs who are so dishonest and so far out--look at Ryan who thinks Ayn Rand should be guiding his thinking--that a vote for Obama is easy for any sensible person. Why is Ryan a "wacko" or "dishonest" because he wants to slow the growth rate of our unsustainable entitlements? Every four years Democrats gear up for an election by repeating over and over how extreme the Republican candidate is. Reagan - a madman; both Bushes - crazy men. McCain - a moderate but actually, no, an extreme maniac. It's the same story. So boring. Not in his temperament or his ideas is Ryan extreme. To describe yourself as a moderate is either a total lie, or you are lying to yourself. Your repeated tirades here have pegged you for a anti-market radical. "what are these "factors" that "continue to limit growth?" I guess the Federal Reserve Board effed up their central tendency projections in January 2009 ((Table 1) as well. But you're missing the point. Let's not regard lack of clairvoyance as "effed up". Let's use these forecasts to see what people were thinking at the time. They were thinking, we're in this huge recessions, but huge recessions bounce back quickly, so we should see some big growth soon. They do not seem to have been thinking, we had this huge financial crisis, and financial crises always lead to long periods of stagnation, independent of subsequent policies. The Grumpy Economist might also have included the chart prepared by Christine Romer and Jared Bernstein that projected the effects of the 2009 stimulus package on unemployment. That chart (Figure 1) at the following link, projected that the unemployment rate would now (3rd quarter 2012) be 5.5 percent if the approximately $800 billion stimulus package would be enacted and approximately 6 percent without it. Of course, the current rate is 8.3 percent. Even that rate is understated due to the very large number of persons who have left the workforce completely. Did they miss the fact that this is a huge financial recession or the fact that fiscal stimulus is not effective as claimed? Or both? This mis-judgement more or less replicates the projected and actual trajectories in the charts above. This is a good point. I've always felt sorry for poor Romer and Bernstein. Their point was the effect of stimulus. I disagree of course with the effect of the stimulus, but that's not important here. They put down a perfectly sensible benchmark forecast, and they said how much better things would be with stimulus. Their benchmark forecast turned out to be way optimistic. But I thought the economy would bounce back too. And that's the point here. Romer and Bernstein, who of all people you might expect to have been of the view that "recoveries are always slow after financial crises" were not at all of that view in January 2009. So it really is an ex-post rationalization (not by them) not a predictable pattern that everyone expected at the time. How can you feel sorry for someone who does something really really dumb? Romer should have known what any reader of Dilbert absorbed long ago: don't promise more than what you can absolutely assure you can deliver. Hubris isn't the right word, but it sure comes close. Contary to your constant complaint that we should leave the patient alone we have a lot of economists who ought to keep their lips sealed, honestly admitting "I don't know." BTW, that is as true for Krugman as for John Taylor and other signers of the Romney letter. The 2010 budget for GDP projections were based on OMB for January, CBO for March and the Blue Chip for May assumptions, respectively. 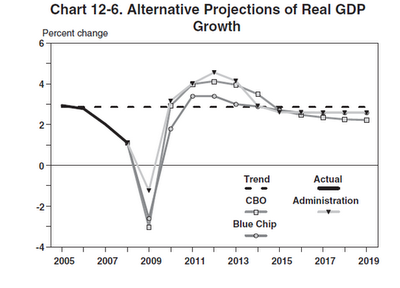 Are you saying that the Blue Chip didn't have information available in that 4 month window that the GDP declines in Q42008 and Q12009 were much deeper than the "real time" OMB assumptions? That eliminates the top blue line in your first chart as evidence of your "mismanaged policy" proposition. But I have not looked at the 2 other budgets to see differences between the OMB and the Blue Chip which is not shown on your charts. There was a strong recovery (in terms of growth rates if not levels) in the thirties once we went off the gold standard and started devaluing the dollar, although the recovery was reversed resulting in a "recession within a depression". The fact that we had the aborted recovery at all amidst lots of terrible domestic policy (to say nothing of economic growth under the Johnson administration, to which Scott Sumner often refers) tells me that monetary policy is very potent. Yet it's not among the factors you listed. Interest rates at zero, inflation between 2 and 3 percent (not huge deflation as in the 1930s), two trillion dollars of QE and counting.. Excessively tight monetary policy just does not ring true for our current troubles. Perhaps the bank regulation arm of the Fed is telling banks not to make loans that the pate-plunger approach to bank reserves is begging them to make, but I haven't seen strong evidence of that. I didn't mention it, because I think monetary policy is not the problem, and is completely ineffective right now. There is simply nothing the Fed can, or should, do. The monetary policy of the Federal Reserve cannot explain the divergence between the administration's rosy projections and what came to pass. Whether one believes that the Fed could have done more (or could still do more) to improve the recovery, the evidence seems clear that the Fed did do as much (and perhaps more) than the prognosticators thought they would do when those projections were made. Stated differently, the administration economists must have included some assumptions regarding Fed policy when they predicted a rapid return to trend growth. I find it hard to believe that those projections assumed nearly zero Fed Funds rates, QE's 1 and 2, Operation Twist, etc. My suspicion is that the Fed has done much more than those estimators thought in their wildest dreams would be done. Most of the arguments coming from the administration (e.g. Larry Summers and fellow travelers such as DeLong, Krugman, et al) seem to have been that the Federal Reserve has done all it can and that, as a result, we need more fiscal stimulus. Whether or not the Fed could have usefully done more is therefore neither here nor there as regards these faulty projections. Is inflation really between 3 and 4 percent? My recollection is that the Fed has regularly undershot its 2 percent target since the downturn, treating it as a "ceiling" rather than a target. Sweden, which has had a relatively strong recovery, devalued its currency early on. Their central bank has Lars Svennson on it, who pushed for a negative interest rate. Evan Soltas has already documented how Israel's central bank seems to be unofficially targeting NGDP (because inflation seems to always go up enough to counteract declines in real GDP). Australia has had 4 percent inflation for decades, avoiding recessions including the most recent ones (although EMH rejecters insist that its just inflating a bubble). It would be hard to have a more expansionist monetary policy than we have now. The Fed is forcing banks to take on more money and then paying them for it. Paying interest on excess reserves is designed to be a contractionary policy. The Bank of Sweden actually charged banks money on excess reserves in order to increase inflation/NGDP. You could take all politics out of this question, and simply look at the Blue Chip forecasts over time. I believe these forecasts were in line with the deep recession-strong recovery theory, and not the slow slog of a financial crisis. From that you can still reach your conclusion: anyone saying today that the slow recovery was predictable is partaking in revisionist history. Interesting post...I am surprised that you didn't mention Reinhart and Rogoff's work, from which many have concluded (rightly or wrongly) that the recovery will be sluggish, and a return to more rapid growth will be long in coming. Of course, just because the Administration's economists thought that a fast recovery was possible, doesn't mean it was. I know you are focused on GDP here, but is there any indication that "jobs" recoveries are getting longer, possibly as a result of some demographic or technological change that reduces the importance of labor in recoveries. "So, the natural conclusion is, what are these "factors" that "continue to limit growth?" If the patient should naturally recover quickly on his own, as every time in the past, perhaps, just perhaps, too much doctoring is to blame?" More obvious implication: Perhaps, just perhaps, he's just that sick. Anemic recovery is anemic. It's fallacious to rely on the past to properly predict the future. Black Swan did a good job of outlining this problem. Now, I have only taken a single undergrad time series course, but how can one properly forecast the response to large shocks when time series methods (ARIMA, etc) smooth out the volatility? Yes, very good post. As for FED policy, I tend to agree with you, but I also think that all would have be worse without monetary expansion. Yes. They artfully accommodated a huge surge in money demand. They did not contribute to the recession by artificial monetary stringency. Why is the recovery slow? The largest single factor, one which needs much more relative importance in how economists look at future recessions, is Regime Uncertainty. Or just uncertainty in general, because it can be caused by many factors. ...The same story can be told for durable goods and assets throughout the economy: given time, the current slump will end itself, the way slumps did in the 19th century. 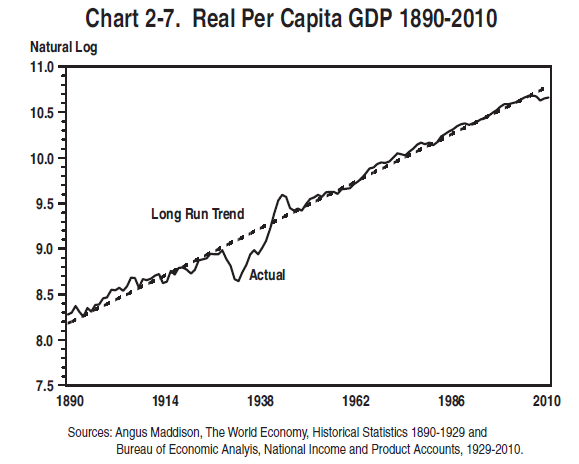 As I said, this may be your great-great-grandfather’s recession. But recovery may be a long time coming. Do you think if the Federal Reserve bought all existing debt and tore it up that there would be no inflation? Summary: Even if innovation were to continue into the future at the rate of the two decades before 2007, the U.S. faces six headwinds that are in the process of dragging long-term growth to half or less of the 1.9 percent annual rate experienced between 1860 and 2007. These include demography, education, inequality, globalization, energy/environment, and the overhang of consumer and government debt. A provocative “exercise in subtraction” suggests that future growth in consumption per capita for the bottom 99 percent of the income distribution could fall below 0.5 percent per year for an extended period of decades. A little more than twenty years ago, I was an excited economics major in his senior year at METU. I had just accepted a position with the prestigious research department of the Central Bank of Turkey. While looking up some numbers, I ended up reading every short-term, long-term, 1-year, 5-year, 10-year plan ever produced by the State Planning Department. What struck me was how the numbers kept changing with each document. Even documents published in the same year fully agreed on all past data. Nor did they agree on their near term forecasts for all sectors. It seemed revisions were made to the past to conform with the present and politically desirable scenarios. When I was done, I had finally really understood Hayek's arguments. What slowed down the recovery in the U.S. were all the attempts to slow down the crash. Point taken. Quick recovery was in everybodies minds, both scientist and politicians. Still the recovery is slow. What went wrong? Is it the Krugman argument? Too little too slow fiscal stimulation? [hard to believe from your point of view] Were the QEs and the twist operations from the Fed too little to late? I can hardly belief that a pure Austrian way to act (doing nothing at all) would have led to the hoped for quick rebound. Should the Fed risk inflation to spur growth?